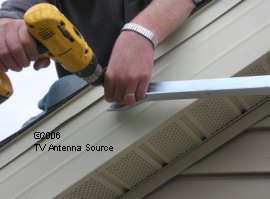 The TV antenna eave mount is a non roof penetrating mount. Many times the eave mount can be placed on the side or back of the house and be kept out of site from the front of the home. 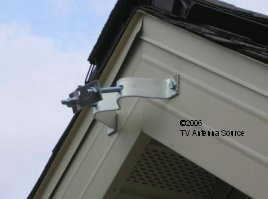 The eave mount is strong enough to hold the largest TV antennas securely. If you need help before, during, or after the installation please contact me at dithaca@msn.com anytime. Or call 1-989 - 875 4902 Monday through Friday from 9:00 AM to 5 PM Eastern Standard Time. A. Place one of the larger bracket halves on top of the other half lining up the center holes. If the holes do not line up properly place the bottom half on top. B. Insert the two small bolts in the outer two hole of the four holes attach nuts and tighten. A. Insert the long bolts through the remaining two holes in the center of the large bracket. Place the pipe clamp strap onto the bolts, thread the nuts onto the bolts and insert the pipe and tighten. This pipe should be short as three feet for ease of installation. If a longer pipe is desired once the eave mount installation is complete replace the shorter piece used for installation with the desired length after the installation is complete. Step 3. Installing the upper bracket. This procedure may be done from a ladder below or from the roof above. In this case I chose the roof above. A. With the small bracket center at the peak, using a drill bit about half the thickness of the lag screws, drill two pilot holes through each bracket hole into the facing board. This procedure will prevent the wood from cracking and splitting and insure a solid mount. B. Insert the lag screws into the holes and tighten firmly. A. Insert the pipe with the lower bracket attached into the upper bracket. 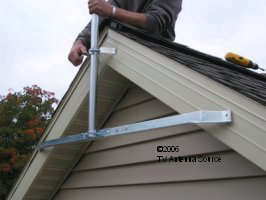 Raise or lower it until the lower bracket aligns with the roof facing and the pipe is level. B. Tighten the bolts in the upper bracket to hold the lower bracket in place. A. With the upper bracket and pipe holding the lower bracket in place drill the two holes in the lower bracket using a drill bit about half the size of the lag screws. B. Insert the lag screws into the holes and firmly tighten. C. If desired replace the shorter pipe used for installation with the desired length. 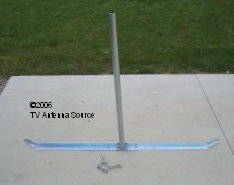 You are now ready to go on to the next step of your TV antenna system installation. 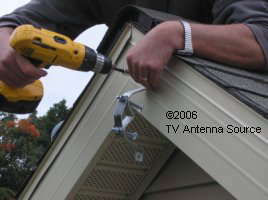 Have a question about installing a TV antenna eave mount?? ?